This analysis of the Twitter reaction to the 2014 State of the Union address employed media research methods that combined Pew Research’s content analysis rules with computer coding software developed by Crimson Hexagon (CH). This report is based on examinations of more than 1.6 million tweets, and is a follow-up to a similar report produced after the 2013 State of the Union speech. This analysis contains two parts. The first is an analysis of the sentiment or tone of the response on Twitter. The second is an analysis of the most discussed topics using keyword searches. The time frame for this report was 9 pm ET, January 28, 2014 to 1 am ET, January 29, 2014. 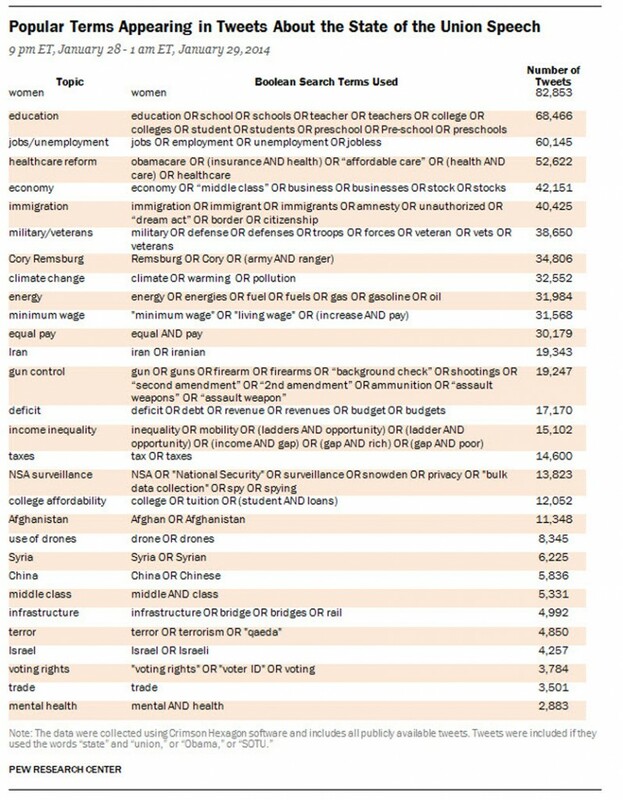 The Boolean search used to identify tweets about the State of the Union address was: (state and union) OR Obama OR SOTU. Researchers classified more than 250 documents in order to “train” this specific Crimson Hexagon monitor. All documents were put into one of four categories: positive, neutral, negative or jokes. A tweet was considered positive if it clearly praised President Obama, his speech or his policy positions. A tweet was considered negative if it was clearly critical of Obama. The numbers reported for this analysis are only of the percent of conversation that had a clear positive or negative tone. The table below shows the exact terms used for the top 30 subjects according to our searches.